Last night if you were on Twitter you likely noticed a lot of tweets about the CBS tv show "Undercover Boss", and it's "guest star"/featured CEO, Rick Tigner. The Twitter account that was most active seemed to be @KJWine, Kendall Jackson's own. I watched the show, though I didn't take it as far as some people, who drank Kendall Jackson wines and hosted viewing parties. Still, the social media leveraging that Kendall Jackson utilized was very impressive, it increased their brand visibility and created conversation about the company and product. That qualifies as a good return on investment, which is contrary to what people like Steve Heimoff claim; that there really is no ROI on social media. My reaction to the show, again being distinctly in the minority, was one of pity for the CEO and admiration at how Twitter and Facebook were used for the public relations (spin) that transpired before, during, and after the show. Let me first discuss how bad I felt the company looked before analyzing the social media aspect. Before I even get that far though, I want to state that this isn't a personal attack on the CEO. Rick Tigner seems like a nice guy, and he got emotional (I think it was real) at multiple points of the show. I believe he does want his company to succeed and does care about the people that work at Kendall Jackson. Just how much he cares is up for debate though. In the opening scenes, we see a group of executives sitting around tasting white wine, presumably the infamous Kendall Jackson Chardonnay, and Rick is describing it with words like "smoke", "oaky", and "buttery". My gut told me the scene was staged for the benefit of TV audiences but it came across as somewhat arrogant and snobbish, making wine look more hoity-toity than it needs to. Not a good way to start, I noted. As we watched Rick screw up in task after task, the entertainment value was replaced by a sense of dread. If Rick is to lead the company, how can he not know his customer-facing employees' job duties and attitudes? In particular, after watching him waste company money attempting to work the bottling line, I was struck at how lost the guy looked doing real work. "I gotta count every row?" 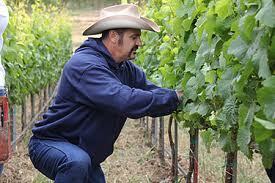 The question is, would I want a guy like him running a company that makes wine? A short answer is no, a longer answer is hell no. The CEO knows less about making wine than I do, yet he controls a company that sells five million cases per year. His attempts at working the vineyards, on the bottle line, running deliveries, and in a tasting room showed that he really has no idea how the lowest levels of Kendall Jackson operate. That's a big red flag, because just like in any other large corporation, the lower you go, the more likely you are to find someone who is directly interfacing with the public on a daily basis. "tastes like apples and pears..?" Mr. Tigner seemed stunned that there were people working for the company that don't speak any English, who the hell did he think picked the grapes and tends the vineyards? Bands of rabid U.C. Davis students and sommeliers? Sorry bud, that only works in Burgundy. He also was seemingly incapable of doing manual labor on a bottling line, and couldn't flip over a case of empty bottles without spilling them everywhere. Having done that with cases of full bottles before, I can tell you that it's a simple task. At the tasting room, Tigner had no clue how to sell a wine club membership, pour a one ounce taste, and I can only pray to Bacchus that he actually was faking his inability to describe sauvignon blanc. I was left with the sense that the CEO of Kendall Jackson is more comfortable behind a desk, telling people what to do and not really caring how they felt about it, just that they did what he felt was best. Either that or more comfortable behind his incredibly expensive Audi S6. Next I'll explore the social media angle that I noticed last night. By all accounts, it's been a smashing success for the corporation winery. Watching the @KJWine account last night, I admired how well whomever ran that account managed to get outside their Twitter bubble and into the mainstream trends. There's an old joke that the only people who tweet about wine are wine people. While partly true, last night's tweets showed that it is possible to extend your brand's reach by generating and sustaining conversation based on a different media source. In this way, the TV show itself was leveraged to build brand buzz on Twitter and Facebook. Through a combination of original tweets and retweets, the twitter account managers kept that buzz going into today. The Kendall Jackson homepage also has links to the TV show and their Facebook page was frequently updated with pertinent facts and details. While it's obviously a public relations coup to score a visit from the Undercover Boss film crew, there is also ample opportunity to squander that publicity. Kendall Jackson may have sold a few more cases of wine in the near term, but the name is now much more common in many American households. How many people going to buy wine (hint: millions already buy wine) will choose K-J because they saw the show? My semi-educated guess is it will be a few thousand, at minimum. There's a saying: "there is no such thing as bad publicity", and even though the company may have not looked like such a hot place to work, the brand recognition metric took a sizable bump upwards. It's impossible to measure exactly how many more bottles of Kendall Jackson wines will sell but based on the audience numbers (unavailable at this time) we can reasonably assume that Kendall Jackson is going to be recognized by more people than before the show aired. Looking deeper, we can also see that because social media leveraged the TV show, wine consumers (who are already on social media sites) had a greater chance of being exposed to some great PR for the company. Knowing this, we can therefore understand that a company (be it winery or otherwise) who uses social media to leverage an event (using this as a general term) properly can therefore expect a rise in brand recognition such that they will most likely (50%+ chance) a rise in revenue as well. Because of the fantastic PR job by both CBS and Kendall Jackson on the TV show and because of the well-managed Twitter campaign waged by the brand managers there, Kendall Jackson will see an increase in wine sales. The people like myself, who remain skeptics and unmoved by the seemingly heartwarming story of a CEO who realizes the need for change, will continue to grumble about how Americans buy into crap like this. Unfortunately (or fortunately) we are a minority and our grumbling is mostly confined to blogs and microblogs. Now all that remains to be seen is how long the changes Mr. Tigner made actually last. The employee's 401k was brought back and there's a new training program for employees who work with Spanish-speaking coworkers, as well as some kind of paperwork reduction program in place. Will that all stick around or is it just going to last as long as the buzz over the show does? Wish I could say I watched it live with the tweets. I just watched it today. Interesting to see their approach in the social media piece. I'm not sure why he needed to go under cover to find out people still want a 401k or benefits, but again, I'm pretty sure that had nothing to do with going on national TV. Wonder how sales will do with the Super Bowl in the coming days. This CEO was shown as totally incompetent in any position, but I also know a tiny bit about how TV can be edited. I'm hoping he's a much better CEO than his lack of ability to pour one-ounce. I suspect a lot of the "issues" he needed to heroically fix could have come to his attention via an employee survey..That's what my former employer did. As for your editing point, I agree, it could have been edited to make him look especially bad. I too hope he's a much better CEO and I do think he wants to be, if he isn't already. I didn't see the show (don't watch TV), but I certainly saw the Tweets and Facebook posts today, how could anyone miss them? My 2 cents: CEOs aren't hired to bottle or pour wine, or even really know anything about wine for that matter. They should know how to make money, how to listen and how to employ the right people to do the right things to keep the company successful. Kendall Jackson isn't a small, family-owned winery where one person wears many hats (or ever did), so to expect Tigner to know how to do any of those tasks is unrealistic, and it sounds like the show successfully preyed on that. As for the marketing benefits: of course they have increased brand recognition and have created a buzz. Big wineries are learning (a la Bonny Doon) that slick ads and slick images don't necessarily sell wine like they once did. Kudos to them for taking a risk in a changing market and for (seemingly) wanting to make a things better for their employees and the company. As to how that risk plays out for them, we'll likely never know. If you've seen any of the other episodes, they are all like this. I have yet to see a single episode (and they are into season 2) where the 'boss' was able to handle even 10% of any of the jobs they had to do. It's the reality of 99.9% of corporations. Kristen, I haven't seen any other ones besides part of a show with the Waste Management CEO, and I barely recall any thing save for the CEO not looking as incompetent as Mr. Tigner. As I was watching the show last night (which I did only because it was a winery CEO) I was shocked at how different Mr Tigner was from some of the people I know that own wineries out there, including some very close to Kendall Jackson. Granted none are huge mega corporations like Kendall Jackson, but that doesn't change the basic lack of understanding of anything wine related they were trying to present. Maybe it was just for the shock value of the TV show (as I believe the show was totally scripted), but I can't believe anybody is really this clueless as to their business. Really, how could he never have visited the tasting room, or never realized that employees want benefits and 401k's or that many of the field workers may or may not speak english. Though I have to believe in that group of workers, somebody would have understood at least some English. I also don't believe the driver would have used anywhere near as colorful language on camera unless they scripted it. The show was more of a Kendall Jackson infomercial than a real look at the top management and owners of wineries. At least the ones I know. Mike thanks so much for the input, I think a lot of what you said rings true. I want to give Mr. Tigner and Kendall Jackson the benefit of the doubt regarding the nature of the show though, I don't think it was scripted, just perhaps edited a bit creatively to show the CEO as clueless. Still, it raises some interesting questions as to how a business can be successful with someone who isn't aware of even basic facts about his company at the helm. I was unable to watch the episode due to traveling restrictions last night, however, after reading tweets and facebook posts, it seems like Mr. Tigner really showed his a$$. I agree with what almost everyone (at least in the wine world) is saying about the increase in KJ's brand recognition and am sad to see how little knowledge this CEO had about the most basic levels of his company, let alone wine. Although we know that a CEO doesn't necessarily need to know how to run a bottling line, I wonder how much more successful Kendal Jackson would be if they had someone running it who truly cared about every level of their business. Thanks for commenting, Courtney! I think (hope?) Mr. Tigner did learn a lot from this experience, and only time will tell if he becomes more familiar with the operations of K-J. From what I know, the show was filmed almost a year ago. Also, I have heard great things about the CEO as a person, so I feel he does care about his employees. I used to work for an $8 billion per year grocery store chain, our CEO didn't have intimate knowledge of each store's day to day operations but he at least got the gist of things at the store level, with respect to peoples jobs. A CEO doesn't need to do manual labor, and specifically, Mr. Tigner's attempts at EASY manual labor were pretty sad. I know that because I've done what he did, and it was EASY. He doesn't need to know precisely how to do everyone's jobs, but he does need to know about the jobs, in order to be a more effective leader. Hey Matt, hopefully my comments weren't too strident or harsh :) It just bugged me to see a giant corporation get free publicity like this, yet no one was pointing out the glaringly obvious flaws.